A few months ago I was looking for a replacement printer and scanner. I tried out a couple of all-in-one solutions (Canon PIXMA MX850 and HP C7280) and was consistently disappointed in the scan quality so returned both of them and decided to get a separate printer and scanner. 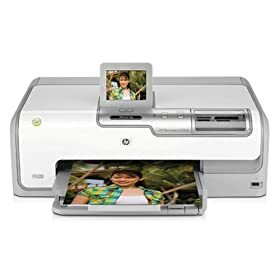 For the printer, I ended up getting an HP Photosmart D7260. The quality on it is amazing, just like the C7280 was, but for $70 cheaper and with a better LCD screen on it. The D7260 can connect directly to your network over ethernet, which is how I have it hooked up, and it lets me sit in the living room with the laptop and print wirelessly over the network - nice. There are slots for several different memory card types right on the front, too, so you can take the card out of your camera, plug it right into the printer, and print directly from there - no need to load the photos on your computer first. Something else I noticed just the other day that was kind of cool: My PS3 has a “printer settings” section that I never looked at. I went in there, told it to search for printers, and it was able to locate and connect to the D7260 over the network with no issues. I’m not sure what I’ll be printing from my PS3, but the neat factor is definitely there. First, for a while I was having troubles getting the paper to feed and thought the rollers might be messed up. Turns out the paper was sort of bunched up and wouldn’t easily separate. Putting different paper in fixed that. Second, this thing is loud. I’m not talking like “Xbox 360 cooling fan” loud, either. This is like “one wood chipper being fed through another wood chipper” kind of loud. Whenever you print, it wakes up and goes through some initialization gyrations, which sound like metal grinding metal. The print happens, which is not too loud, and then when it’s done it goes through something that sounds just like the initialization actions. If you can ignore the noise, this thing is pretty cool.